Chris Achilleos is an artist and illustrator who designed the covers of over 30 Target Doctor Who books in the 1970s. 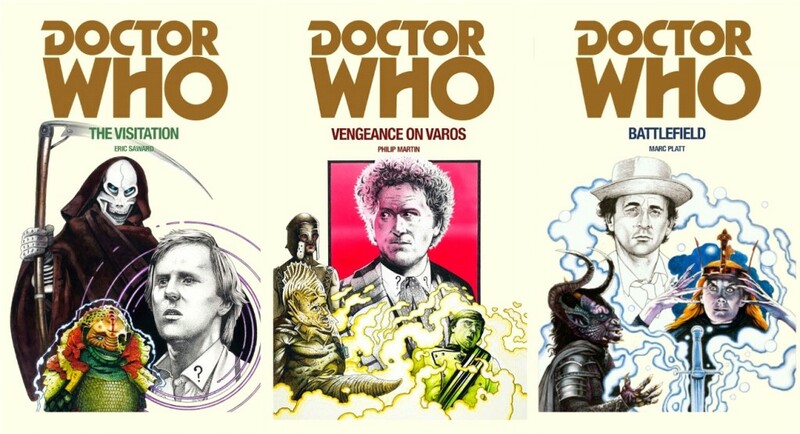 The Doctor Who Companion spoke to him on the publication of seven new editions of classic-era Doctor Who novelisations: The Zarbi; The Web of Fear; The Dinosaur Invasion; Genesis of the Daleks; The Visitation; Vengeance on Varos; and Battlefield. The last three titles have completely new cover illustrations. 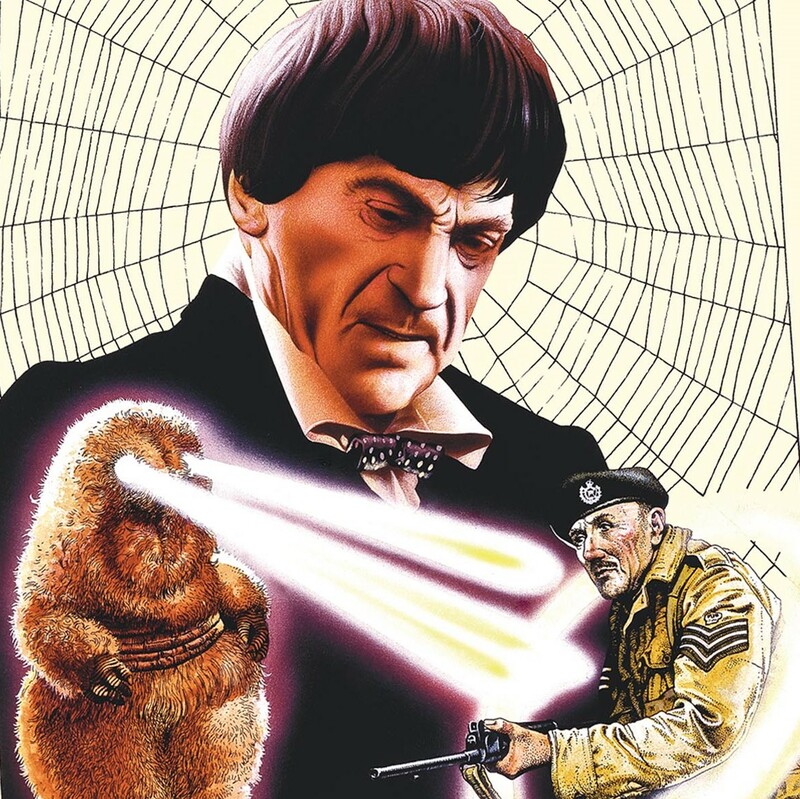 To coincide with the reissue of the books, The Cartoon Museum in London will be hosting Doctor Who: The Target Books Artwork, a display of original cover artwork from the classic novels by Chris and other artists from the range, from 28th April to 11th May 2016. DWC: How do you feel about the new covers? Was it exciting to go back and do some new work on Doctor Who? How did it feel to do new work? Well, it’s not that I haven’t done one since the seventies, I have been doing others. For instance, SFX magazine commissioned me to do some covers a couple of years ago – I did a new one for The Green Death and one for Blink. And I’ve done a few private commissions once so it was not difficult for me to do these three new ones. That style of having the Doctor in black and white and different characters from the story in colour – there’s something about that that works really well for Doctor Who; it’s very unusual, very distinctive I always thought. Well, I always saw them as graphics rather than paintings. They were very small book covers and you had to do something very impactful to grab attention and that worked very well. But it wasn’t always the Doctor’s face in black and white on them, I did some colour ones to try and move on a little bit rather than doing the same theme all the time. I took a chance and did different things, like using the work ‘Kklak!’, or even leaving the Doctor’s head off altogether, stuff like that to make it interesting. It was not always appreciated! Oh yeah, if you know anything about me you know how much I was influenced by comics. It’s such a great action image. Were the publishers not very keen on you using that word ‘Kklak!’ on the cover? No they were not! I always submitted the work to the art director but then later on I used to go straight to Tandem Books which was Target – I always knew them as Tandem because I used to do lots of other work for them. They were under the same label; they were just in different rooms. I used to take the Doctor Who covers in there and sort of unveil them. It was always ‘Wow, it’s great Chris!’ but on that occasion there was silence, then ‘What’s this “Kklak!”?’ I said ‘What do you mean? It’s part of the design’, I thought kids would love it. That’s one of the most memorable ones! It’s not my favourite cover but it’s the one that people talk about the most. There were some problems with that, they wanted me to take it out but I refused to do so. I can’t remember exactly what happened but I got away with it! Then they got all the fans letters coming in from people saying they loved it and they realised I was right. Later when I left the Doctor’s head off some covers they asked ‘Where’s the Doctor?’ I said he didn’t fit in, like on The Ice Warriors, that’s my favourite design now. I’ve moved on: it used to be Genesis of the Daleks; now I prefer that because it’s such a perfect design. I could not bring myself to ruin a perfect design just so I could show the Doctor’s head. So when you were planning the images, was it more or less up to you what you included and then the publisher would give their views after; is that how it would work? I got no briefing at all. I did so many over the years. The first ones were the ones where we worked out the style and the content of the covers. I did Doctor Who and the Zarbi and there was no reference material for that – in those days it was just two or three black and white photos, if you could use anything you were lucky. I would get a synopsis and read through that, I was used to doing book covers so I would copy the action. I did a rough image with some real ants but they came back and said ‘No, you have got the wrong idea, Chris – the BBC want the real characters, the real models to be shown,’ and of course my reaction was ‘Why didn’t you tell me this?’ It happened a lot when I was freelance, you would get the wrong brief or there would be no brief, or they would change their minds. At first I was pretty annoyed about it but I went and got some reference photos and I realised that was the way to go. They’ve picked some nice ones for these reissues. The Genesis one is there – that always seemed quite an unusual one, almost photographic, particularly the Dalek and the Doctor. Yeah, like I say the Genesis cover used to be my favourite. I just enjoyed doing that one very much. 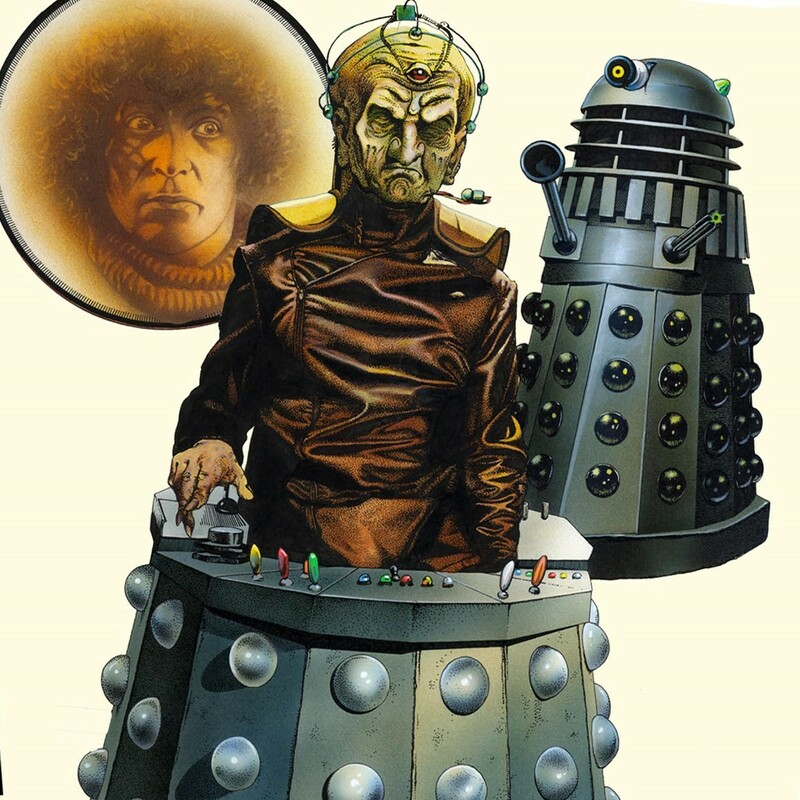 It had a Davros in the middle; it felt like a very good design, it was a nice one to look at. And the way I did the Doctor, not using the dots, in a watercolour kind of way, with the Dalek at the back… it was a very satisfying design. We’d changed the format by then so the pictures would go to the top behind the logo. And we’ve got The Web of Fear as well, with the web going right up behind the logo as you mention – that’s a really striking image. Yes, I did a few Patrick Troughton ones and I really loved those. The thing I remember from buying the books when I was younger is that you didn’t have videos then and if you’d never seen the story the cover really told you what the story was about – it was the only thing you had to tell you what the images were in the story. Exactly, you had to encapsulate the whole story in the picture on the cover. 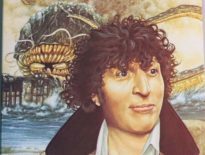 It’s not an easy thing to do, and that’s what I try very hard to achieve on any book cover, not just Doctor Who, and also stay faithful to the author’s description of things – the characters, whatever was portrayed. But also you have to bear in mind that this was not editorial illustration where you have a captive audience and they want to look at the details. This is a miniature poster to attract the attention of people passing by so you have to make it very attractive and punchy, and make it stand out from the rest and that’s what I was good at. Some of your designs will be in the new exhibition – will you go along to have a look yourself? Yeah, why not? It wouldn’t be complete without me! (laughs) It’ll be nice to see my work; some of it’s in other people’s possession now. So you’ve sold some of the originals? Yes, in the eighties. The eighties was like the dark ages and nobody wanted the artwork. I was going through a bad spell and needed to earn some money so a lot of them went for very little. You can’t keep these things forever. I still have a lot of my work here, I have a few new Doctor Who’s like the ones I did for SFX and the three new ones I just did. The three new ones are going to be at the exhibition and the older ones will also be coming from various collectors. 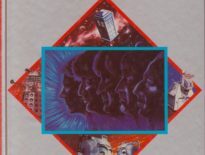 Finally, Doctor Who is just one thing you’ve done among lots of other things – there’s all your fantasy work, the film posters, you did the Star Trek books – how do you feel about your Doctor Who work now? At the beginning I was quite happy to be doing them. The demand was so great and they were selling so well. I had to do one every month. A Doctor Who cover would take me a whole week to do while a fantasy piece would take me two to four weeks; I used to put a lot into them. I began to think it was too many and I couldn’t do them all so they got Peter Brookes to do some which didn’t go down very well, I was told. But I continued to do them, I was happy to do them, it was steady work and I enjoyed doing them until something happened which came between the publisher and myself and it had to end. Just as well – I was more into the fantasy thing my then. But now they’re great fun to do. I’ve been doing conventions for many years and I get people coming up asking ‘Why aren’t you doing more covers Chris? Why aren’t you doing the DVDs?’ like it was my fault that I wasn’t doing them! My answer is always ‘Well write to the BBC or to the publishers and tell them that’. We’ll see how they go, I’m hoping they’ll ask me to do some more. For more on Chris’s work visit his website. Full details on the forthcoming exhibition available at The Cartoon Museum. 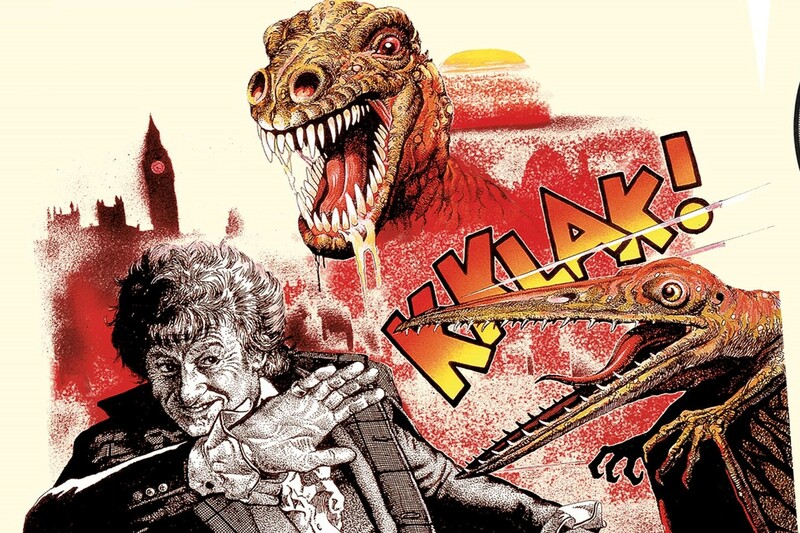 ← Sign O’ The Time Lords: Could New Companion Bill Be From The 80’s?